Last weekend I became a writer, and an award-winning one at that, and I learnt never to doubt a fortune cookie prediction. In lots of ways, it was quite a turning point. I told you last week that I’d been picked to take part in Pitch Perfect at the Bloody Scotland festival of crime writing and how I would have three minutes to pitch my novel to a panel of industry experts. I wasn’t nervous about the talk itself as I’ve done plenty of public speaking and quite enjoy it, but standing at the lectern afterwards in front of an audience while that same panel of experts – Jon Wood from Orion; Karen Sullivan from Orenda and Emad Ahktron from Michael Joseph – gave me feedback? That was a truly terrifying prospect. Even more so as I’d looked around the audience and seen quite a few authors such as Louise Welsh and Lin Anderson. Fortunately, it went well. People even laughed at my vaguely witty aside about the rather odd way that my main character developed – it’s a long story and I’ll tell you about it another time. The panel all said positive things about my pitch for Death Will Find Me. After their conferring when they announced that the winners were Graeme Morrice, Matt Wesolowski and yours truly I was completely stunned. And thrilled. The icing on the cake was the two women behind me – readers who’d paid actual money to hear us pitch our novels – who tapped me on the shoulder and said that they liked the sound of it and hoped to see it in bookshops soon. Other people stopped me in the corridor afterwards to congratulate me and by the time I got to the Green Room and a cuppa I felt a bit teary. The thing is that writing is something I’ve always wanted to do but never quite got round to for all sorts of reasons such as crushing doubt in my abilities, to being too busy to find the time, to being intimidated by the actual published authors that I deal with on a daily basis. Even after we’d sold the bookshop and I had more time, it took me two and a half years to have an actual complete finished manuscript. A manuscript with faults and which I’m currently dismantling and putting back together with a stronger plot. 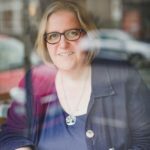 With crime fiction it doesn’t matter how good your writing is or how compelling your characters, if the plot that underpins it is a bit flimsy readers can spot it a mile off. I’ve never liked referring to myself as a writer because it’s always felt rather cocky and besides, I know too many people in the industry to feel confident doing that. Trust me, there’s something quite crushing about having a published author that you respect say ‘oh, you’re writing a book? How’s that going?’ However encouraging they are you feel that they’re thinking you’re crazy. But being one of the Pitch Perfect winners has given me the validation I needed to call myself a writer and to treat it as a priority. I’ve done it here but I never really look at my stats and mostly assume that it’s only my mother-in-law that reads it. 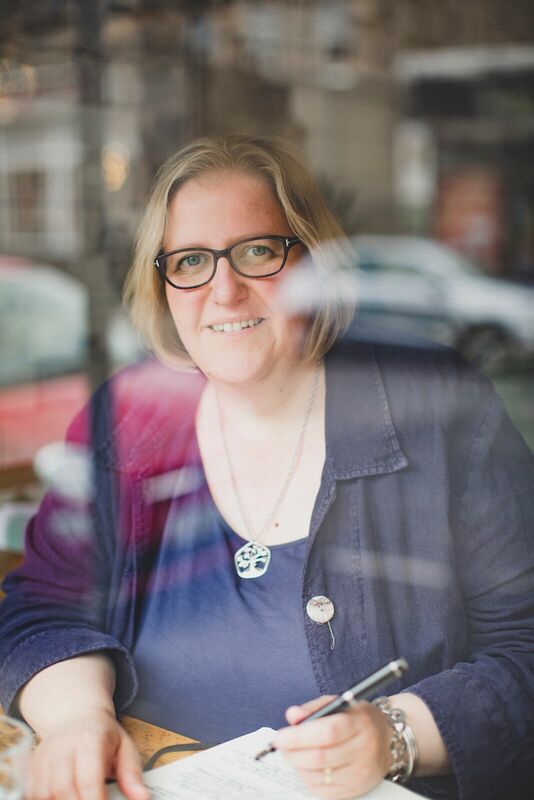 However, now that I’ve had that small success I’ve had a burst of confidence and even changed my Twitter bio (@Ness_Robertson if you’re interested) to read “Bookseller at The Glenogle & Bell Book Company and writer – winner of Pitch Perfect at Bloody Scotland 2015. Often found on windy beaches or in hipster cafes.” I was inspired to start writing in earnest on Monday morning but I caught the most horrible cold over the weekend and have spent the last few days feeling very sorry for myself. It’s Friday tomorrow and I’m hoping that I’ll feel up to at least opening my Scrivener file and seeing where I’m at. I’m not sure that my laptop and I will make it to one of the hipster cafes where I like to write though, not with my current hacking cough. I once read some writing advice from Ian Rankin: ‘Get lucky. Stay lucky.’ I was very lucky last weekend because my fellow pitchers all had great ideas and now I need to make the most of that and work like stink and hope that I can stay lucky because talent on its own isn’t always enough. 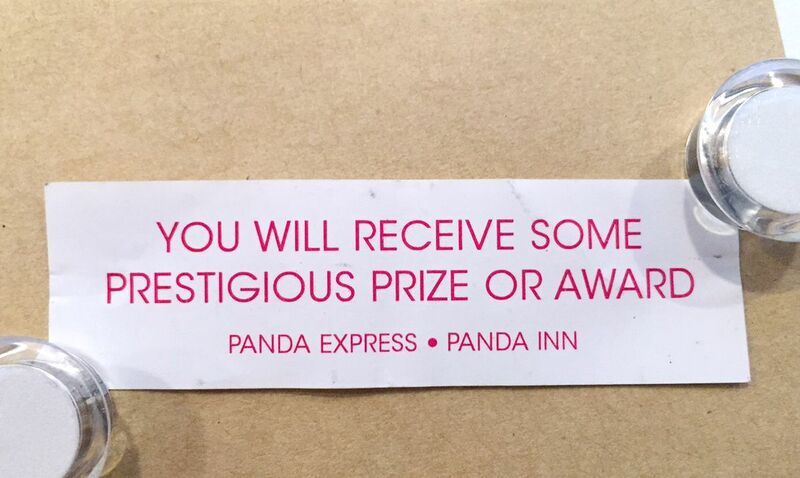 And the fortune cookie? 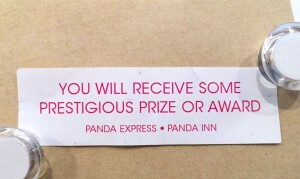 That was from Panda Express in Palo Alto, California in August. I opened it just after I’d submitted my entry to Pitch Perfect and rather than bin it as usual – I’m not a superstitious person – it felt like an omen and I tucked it in my diary. It’s on the pinboard above my desk and I think it will be staying there, hopefully bringing me more luck. This entry was posted in My Writing and tagged advice, Bloody Scotland, crime fiction, fortune cookies, Pitch Perfect, writing. Bookmark the permalink.